Tot School and Toddler Curriculum Made Easy! 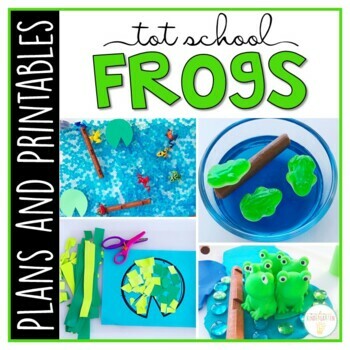 This Tot School: Frogs resource has everything you need for a week packed full of frog themed fun and learning. My tot school weekly plans are designed with the 2-3 year old child in mind. 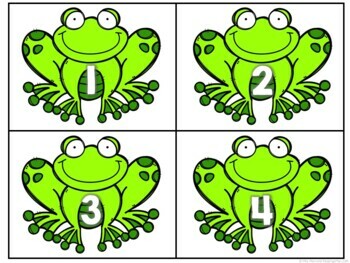 Every activity can be used at home with one or more children or adapted for use in a day care/preschool classroom. Tot school is all about exploring and learning together while exposing children to a variety of skills and concepts. See all 25 books/activities for the week on one convenient page. Every week includes 5 books, 5 fine motor activities, 5 gross motor activities, 5 snacks, and 5 sensory bins along with a few other activities you may want to try! Prepping for the week is super easy with this checklist. 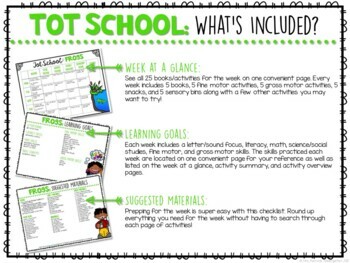 Round up everything you need for the week without having to search through each page of activities! 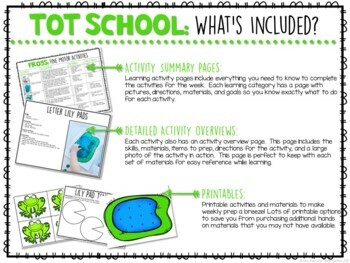 Learning activity pages include everything you need to know to complete the activities for the week. Each learning category has a page with pictures, directions, materials, and goals so you know exactly what to do for each activity. Printable activities and materials to make weekly prep a breeze! Lots of printable options to save you from purchasing additional hands on materials that you may not have available. Want to see more photos of each of this week’s activities in action? Click below for large detailed photos of our tot school adventures! •	Go to your My Purchases page. Beside each purchase you'll see a Provide Feedback button. Click it and you will be taken to a page where you can give a quick rating and leave a short comment for the product. Each time you give feedback, TPT gives you feedback credits that you use to lower the cost of your future purchases. I read all feedback, and value your thoughts and suggestions! •	Look for the green star next to my store logo and click it to become a follower. Easy Peasy! You will now receive updates about Mrs. Plemons’ Kindergarten.